Inishbofin Cycle Hire is located on the pier of Inishbofin, County Galway. Bikes are the main method of transport on the small island and can be hired on arrival at the new pier or Kings Bike Hire in Lower Middle Quarter. 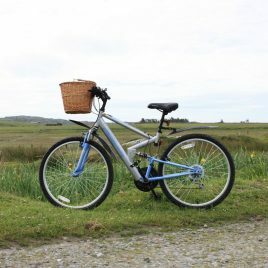 A range of ladies, gents and children’s mountain bikes are available to hire from Inishbofin Cycle Hire. Each bike comes with helmet and bicycle route map. Bikes can be hired on an overnight or weekly basis. Each rental requires a small refundable deposit. Group rates are available.